The votes are in - most people wanted to know more about the Tempest Battleship, so here it is! Increasingly concerned (some would say 'paranoid') by the heightened militarization of the Cirin Alliance during the mid 27th century, the Republic of Daranir decided it was time to commission their own grand-scale warships. The first step was to build an effective Carrier, and the "Castellan" was born, and the second was to create a battleship capable of going toe-to-toe with the best of them - this gave birth to the "Tempest". The construction process was delayed several times due to design flaws and budget issues, but the first battle-ready Tempests entered service just a matter of weeks after the official deceleration of war between the two neighbouring governments. The Tempest is the most powerful warship in the Republic fleet, and a fair match for any ship fielded by the UTC or the Alliance (though still a featherweight compared to the Souri behemoths). Bristling with guns, torpedo bays and armed with a massive energy lance, the Tempest's main weakness is it's poor acceleration and limited maneuverability. 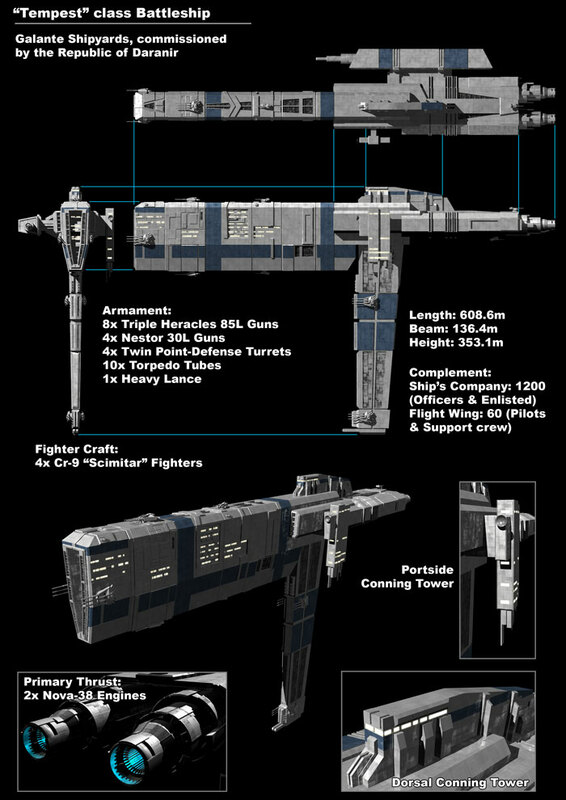 The Tempest was the first capital ship I designed/built, so it's less detailed than my later designs. I plan on revisiting it some day and sprucing it up a little. It helped me settle on a design-ethic for Republic warships, with a kind of grand cathedralesque quality (notice the buttresses around the dorsal conning tower).